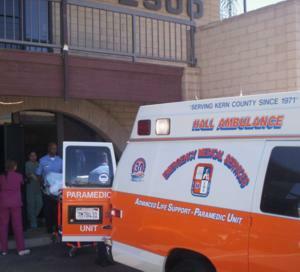 Monday's botched abortion victim is loaded into ambulance, while abortionist Wright prepares for his next victim. Staff members at Bakersfield's �Family Planning Associates� abortion chamber began arriving for work early Monday morning last week, preparing for a busy day of profiting from the agony of innocent children ripped from their mothers' wombs. Before 8 am, several women scheduled for abortions had already arrived, but the abortionist was strangely absent. Terri Palmquist and other Christians standing on the sidewalks reached out in love to those being led to the slaughter, but they were met with extreme hostility. One young woman, portraying herself as a �witch,� said she was putting a "hex" on Terri. Abortionist Kenneth Wright did not arrive on the scene until almost 10 am. By that time, the waiting room was clearly backed up with women waiting for the abortionist to violate the sanctity of their wombs. Terri warned the women about Wright's track record of botched abortions, mentioning lawsuits against him because of women he injured or killed. About two hours after Wright arrived, an ambulance pulled up to the abortion chamber. Paramedics spent about 30 minutes inside the killing center trying to stabilize the victim. Eventually she was transported to San Joaquin Community Hospital. Some Hall Ambulance employees tried to prevent the Christians from taking photographs to document the incident. When her husband was sent to prison, �Laci� was thankful that she was finally free from his methamphetamine-influenced oppression and physical abuse. But then she discovered that she was pregnant. Already struggling to care for their toddler, Laci told herself, �I don�t want to have another baby from this guy.� So even though she was already feeling the baby moving inside her, she scheduled an abortion in Bakersfield, some two hours away from her home. Walking up the stairs to the abortion chamber�s waiting room, Laci heard a voice calling out �you know in your heart you don�t really want to be here! We would like to help! Please give us a chance to help you.� Laci turned and smiled to Terri*, who was offering help to her from the sidewalk, but then Laci quickly reminded herself of her predicament and continued inside. As she waited for her name to be called, Laci noticed that many of the women in the waiting room were far along in their pregnancies. �I don�t think they realize what they are doing,� Laci told herself, forgetting for a moment that she intended to do the same thing. But Laci reacted differently, saying �well, duh, we�re here murdering our kids!� She had heard enough at Victory Outreach to know that what she was about to do was wrong. Finally Laci�s name was called. Laci was told that before the abortion she would need an ultrasound to measure the size of the �fetus� in her womb. Laci asked to see the ultrasound. �We�re not supposed to,� the abortion staff member responded at first, obediently following her training to reject a woman�s �choice� in such situations. But when she looked at the screen she decided to make an exception. Laci was then told that because of the size of her babies, she would need to go to Long Beach for a �partial birth abortion.� But once Laci saw her babies, abortion was no longer an option. Her mind was now focused on the tiny children in her womb, and even her difficult circumstances could no longer motivate her to abort them. Terri offered to connect Laci with a Christian in her community who will help her through the pregnancy. Laci left before the abortionist had arrived, with her love for her babies already growing. �I know that my babies are going to be cute!� she exclaimed as she left. As a black man wearing a basketball jersey walked upstairs with a pregnant woman, Terri told him �you could be playing basketball with your son someday.� Within a few minutes the couple came down from the killing center and drove away. A girl who portrayed herself as a �witch,� saying she was putting a �hex� on Terri on her way into the abortion chamber, came out crying three hours later. She told Terri that she would not abort her baby and accepted literature. Several others who had been extremely hostile earlier in the day also came out crying during this time (which happened to be shortly before an ambulance arrived because of a botched abortion). �Sandy� meant to call the FPA abortion chamber to find out what time she could come in, but instead she dialed 323-2229, the number for LifeSavers Ministries. Terri thought that she was asking about when she could come to the LifeHouse for a free pregnancy test, and encouraged her to come in the afternoon. Terri asked �do you think that God wanted you to call me instead?� Then Terri asked Sandy if she could pray for her. Sandy agreed. Terri asked God to give Sandy clarity of mind and take away the spirit of fear that was tormenting her and making her feel like she couldn�t provide for this baby. Within minutes, Sandy called back, but she was once again trying to reach FPA. A few hours later, Terri called Sandy to tell her that a woman had just been taken to the hospital because of a botched abortion. Sandy told Terri that she had cancelled her appointment and that she and her boyfriend decided to talk to his mother later that day about keeping the baby. Ask the Lord to use you today to expand the knowledge of God, His Law and His mercy, in our community and nation. Father, please guide us into your paths, so that we may fulfill every aspect of the ministries you have set before us. Let the evil deeds of abortionist Kenneth Wright be exposed so that women and their children may be protected, and let Wright acknowledge his sin and turn to You. Be with �Laci� as she seeks to build a new life for herself and her children. Help her to put her trust completely in You to bring her through this trial. Grant your grace and wisdom to the senators who will determine whether or not Harriet Miers will become a Supreme Court Justice. Let those with an evil agenda be thwarted. Minor girls are often seen entering the FPA abortion chamber with older adults who seem to be school counselors or social workers. Although parents must be grant permission for a girl to receive an aspirin, the violent act of abortion can be committed on a young girl without the parents' knowledge (though, tragically, some parents later find out when the girl is rushed to the hospital or suffers other complications). Proposition 73 requires California abortionists to notify a child's parent or guardian before an abortionist may violate her womb. For information and tools relating to this initiative, go to ParentsRight2Know.org. A voting guide for all of the initiatives appearing on the November 8 ballot is available from the Randy Thomasson's Campaign for Children and Families. With the 109th Congress and the White House now more receptive to pro-life legislation, dozens of Congressmen (and Congresswomen) are co-sponsoring the Right to Life Act of 2005, which will stop abortion dead in its tracks. More information on this bill and its sponsors is available at www.righttolifeact.org. Note: The below article was prepared before Harriet Miers withdrew her name from consideration for the Supreme Court. However, the articles referenced are still worth reading, because there are important lessons our nation (and President Bush) should learn from this controversy. Supreme Court nominee Harriet Miers is an evangelical Christian who has been a member of a pro-life group, and Dr. James Dobson of Focus on the Family has publicly stated that for these reasons he believes that her presence on the Supreme Court would be good for the nation. Apparently, President Bush has reason to believe that Miers would seek to overturn Roe v. Wade, although he says they have never discussed abortion. Jill Stanek noted that if the president believes (as he has stated in the past) that it is his job to help change the culture so that "every child [may be] welcomed to life and protected by law," he has missed a great opportunity to do his job. Recently released speeches given by Miers over a decade ago suggest that her opposition to abortion may be weak. Some believe that Miers could become the next David Souter--a pro-abortion liberal justice nominated by a pro-life conservative president. But is Miers even qualified to be a Supreme Court justice? George Will, Robert Bork, and others have emphatically proclaimed that she is not, emphasizing that opposition to Roe v. Wade is not enough. Miers' "common sense" approach may lay the foundation for future "Roes," according to Ann Coulter. But if Bush learns from his mistakes, Peggy Noonan suggests, perhaps this "marriage" can be saved.